Skamania County is located about 40 miles east of the Portland metro area, in the beautiful Columbia River Gorge. Almost 90 percent of the county is timberland, mostly within the Gifford Pinchot National Forest. Much of the non-timber land is concentrated in the southern strip along the Columbia River, and falls under the protection of the Columbia Gorge Scenic Area. As a result of these factors, the county has a small population and job base, and projections generally call for modest growth in jobs and population over the next 20 years. Twenty-five years ago, Skamania County’s economy went through a wrenching transition. Long dependent upon timber for jobs and income, the county lost both when logging was curtailed on national forests, and the Stevenson Co-Ply, the county’s largest employer (owned cooperatively by current and former workers), closed. Ten percent of the county’s job base disappeared, and unemployment topped 22 percent in February 1992. But a year after the closure, the Skamania Lodge, a new destination resort subsidized by federal funds from the Columbia Gorge Scenic Area Act, opened, with almost the same number of jobs. Almost overnight, Skamania had shifted from a timber economy to a tourist economy. Employment changed little in the subsequent years, with a brief uptick late in the 1990s and a corresponding loss heading into the 2001 recession. Job growth picked up in 2002, but the Great Recession wiped out much of the gains. The transition from timber to tourism was accompanied by a shift in occupational structure, and generally lower wages and income (though official wage data do not include tips). In addition, ex-timber workers who commuted to Clark County for retraining discovered that the commute to the Portland area wasn’t all that onerous. While the number of employed residents grew by about 15 percent during the 1990s, the number of those commuting to jobs outside of the county grew by almost 50 percent. In 2015, 67 percent of the county’s earned income came from jobs outside of the county. Indeed, almost half of the population growth in the 1990s came in the southwest part of the county closest to Portland. Skamania County will likely see slow employment growth over the next few years as the Gorge area in general expands. The county labor force was estimated at 5,081 in 2016, with an unemployment rate of 7.2 percent. That was well below the peak of 13.1 percent in the 2008-09 recession. Unemployment has declined steadily since 2009. It should be noted that county unemployment in the 2008-09 recession was not as bad as the 2001 recession or the early 1990s. Skamania County nonfarm employment grew steadily from 2002 to 2007, dropped sharply in 2008 and 2009, and stabilized from 2010 to 2014. Revised data indicate that the county lost jobs in 2015 (-70 jobs) but gained 100 jobs in 2016. Over the 2002-2016 period, despite the ups and downs, private sector growth was strong, averaging 2.4 percent per year. Job growth was concentrated in manufacturing (+80), hospitality (+200), retail trade (+60), and all other services (+90). It was a different case with the public sector. Both federal employment (-110 jobs) and local non-educational government (-80 jobs) suffered losses. In 2016, of the 2,270 jobs in the county, 29 percent (650) were public sector, a much higher proportion than for the state and nation. Leisure & hospitality (650) and manufacturing (280) dominated the private sector. Logging restrictions on federal lands curbed harvests in the early 1990s, leading to a loss of timber jobs. Timber harvests fell from around 400 million board feet in the 1980s to as low as 24 million board feet in 2009 before rebounding to 87 million board feet in 2016. Stevenson Co-Ply closed in 1992. Skamania Lodge opened in 1993 and expanded in 2003. Tourist related restaurants, retail and services have developed in the Stevenson area. The closure of the federal Wind River Nursery in the late 1990s. Molded Fiberglass, a trucking industry supplier, opened in 1995, had peak employment in 2000, but then closed after its major customer retrenched during the 2001 recession. The Bonneville Hot Springs resort opened in North Bonneville in 2002 and then closed at the end of 2016, to be replaced by an inpatient treatment center. Insitu moved about 100 jobs to Stevenson in August 2009, but these were transferred back to Klickitat County in 2014. Skamania County’s agricultural production is a fairly small part of the county economy. According to the 2012 Census of Agriculture, there were 144 farms in the county, covering 6,473 acres. While those numbers are up from the last Census, the county still had fewer acres in farmland than any county in the state. The main crop in Skamania is actually trees. 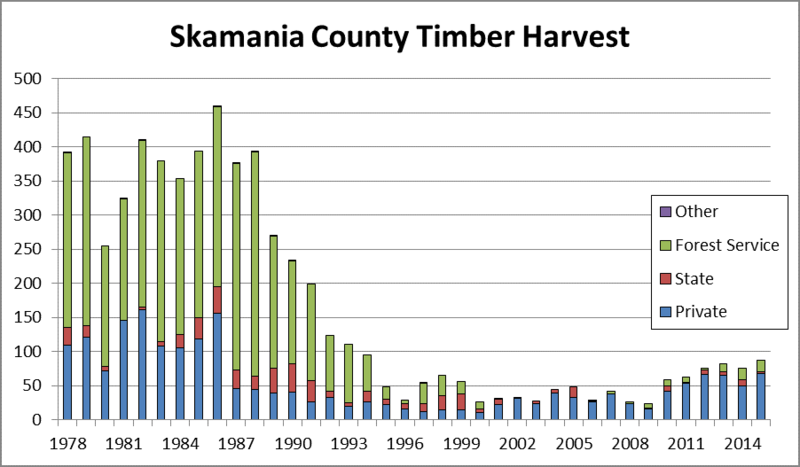 In 1982, the timber harvest in Skamania was 410 million board feet, with about 60 percent from federal land and 40 percent from timber industry land. Logging from both sources had all but dried up two decades later. Timber harvest was 87 million board feet in 2015, with most of the cut on large private (non-industry) holdings. Logging employment in the county declined from 90 jobs in 1990 to 10 jobs in 2016. Males held a majority (50.1 percent) of the non-federal jobs in Skamania County in 2016, a reversal from 2015. Female-dominated industries included education (75 percent), accommodation & food services (59 percent) and retail trade (61 percent). Male dominated industries include manufacturing (80 percent) and construction (71 percent). Older workers (aged 55+) made up 25 percent of jobholders in the county, a bit higher than the 22 percent statewide. 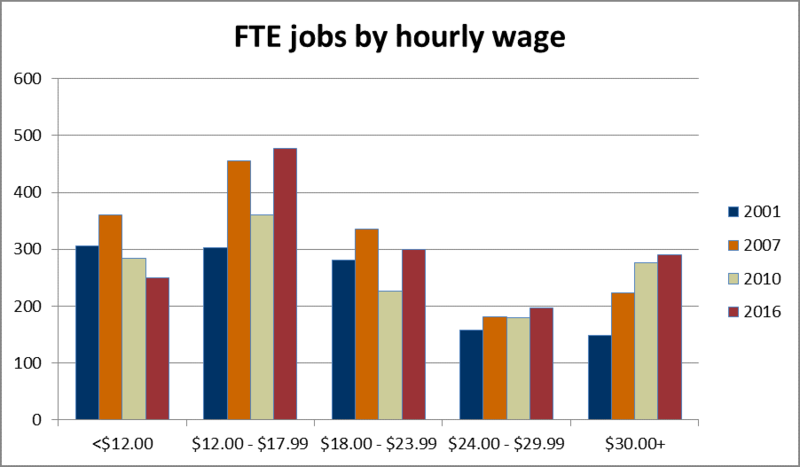 The median hourly wage for non-federal jobs in Skamania County was $18.45 in 2016, down a bit from the inflation-adjusted 2012 high of $18.72.  The county was about $2.00 per hour shy of the state average if King County were excluded. Skamania has generally seen a positive shift in wages over the years. Compared with 2001, there are fewer lower-wage jobs (below $12.00 per hour), more moderate-wage jobs ($12.00 per hour to $23.99 per hour) and more upper-wage jobs ($30.00 per hour and up). The 2016 average annual wage of $35,687, was a gain of 1.4 percent and the second consecutive increase after six years of stagnation. Median household income in Skamania for the 2011-15 period was $52,374, not significantly different from the 2006-10 time span. The household median was 3 percent below the national average, while median family income ($66,374) was slightly above the nation. In 2015, county per capita income was $38,725. That was 25 percent below the state average, and 20 percent below the national average. The gap between the county and the state and nation has closed by about 5 percentage points since 2000. Most of the difference was in earned income, which on a per capita basis was $8,000 lower than the nation and $11,000 below the state. Investment income was also a bit lower in Skamania. Transfer payments were higher primarily due to Social Security payments to Skamania’s older than average population. Skamania’s population was estimated at 11,690 in 2017. Over the past decade, population has grown by 0.7 percent per year, just below the national rate. 20 percent was aged 20 to 39, versus 27 percent statewide. 30 percent was aged 40 to 59, above the state figure of 26 percent. 29 percent was aged 60 or older, beating the state average of 21 percent. The county is also less diverse: in 2016, 89 percent of the population was white and non-Hispanic. Skamania residents are less likely to have a college degree than in the state or nation as a whole. In 2011-15, 22.0 percent of the population aged 25 and older had a bachelor’s degree or higher education, vs. 32.9 percent statewide.